Palmdale Sheriff’s Station would like to provide some safety tips to residents to avoid being a victim of auto thefts. Following these easy tips reduce the chances of criminals targeting your neighborhood. Did you also know that 90’s Honda’s and Toyota’s are our most targeted vehicles? We want to help you from not losing your valuable source of transportation. 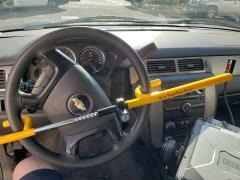 Bring your vehicle registration to the station showing you own a 90’s Honda or Toyota, and live in the Palmdale Sheriff’s Station service area and we will provide a free “The Club” steering wheel lock. For any additional information, contact the Crime Prevention Unit at 661-272-2604. Please remember, you can always report any crime anonymously by visiting Crimestoppers.com or calling 1-800-222-TIPS.